They say- if you’ve got a secret to keep from sailors- put it in the sailing instructions as no one reads them anyway! That was certainly the case for Sunday’s long distance race of the San Francisco Classic hosted by the St. Francis Yacht Club where the top 4 leading kite boards rounded mark 3 of 14 in the wrong direction despite charging down the slalom course to Berkeley in just over 1 hour. 36 kite and formula windsurfing boards started the race but only 19 finished! Saturday’s long distance race is actually 2 races rolled into 1 and one of my favorite races of the year. Ive done it about a dozen times, abandoned once after breaking down and even won the 2 races back in 2009. Its a 40 mile + grueling long distance race open to kites and boards that takes every ounce to finish. 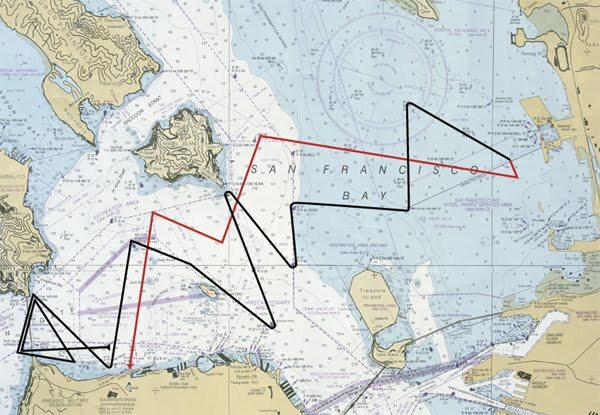 The first part of the race is the San Francisco Classic which takes sailors on a full tour of the Bay with 2 triangles around the red nun outside the golden gate bridge from Crissy field, then a slalom course across the Bay on beam/broad reaches from Anita Rock to Harding Rock to Blossom Rock to Blunt to R4 buoy to R2 buoy to the top of the Berkeley pier, to Olympic circle X buoy and back to the bottom of the Berkeley pier. Crossing the finish line starts the 2nd half of the race – the Ultra Nectar Challenge- which brings sailors back upwind on any course they choose to a finish in front of the St. Francis Yacht Club.